The Vietnamese are a pragmatic people. They may have fought the Americans in a nasty 20-year war until 1975, but if you are a United States citizen you are made very welcome. Perhaps money talks. Not quite so the Chinese, rulers of the country for many years. They are seemingly kept at arm’s length, also the French, masters for 100 years until 1954. Back in 1640 the written form of Vietnamese, in Chinese characters, was exchanged for Latin writing. Today a European is able to read Vietnamese, even if he cannot understand (nor the person being spoken to!). English is the first foreign language taught at school. It is a Communist state owing allegiance to no one but itself. Ho Chi Min, its ascetic founder, wanted no fuss at his death, but copying Lenin his cadaver rests on public view in a massive mausoleum in the centre of Saigon. 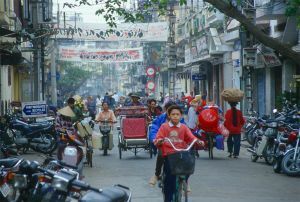 Vietnam is keen to attract foreign business people and leisure travellers and with that in mind the country’s government has relaxed visa requirements. In what is a major breakthrough British, French, German, Italian and Spanish citizens can travel to Vietnam (for all purposes) for a period of up to 15 days. Entry in the new terminal 2 at Noi Bai International Airport in Hanoi was just a matter of a quick photograph and a cursory look at one’s passport. Also now completed is a six-lane freeway to the city centre via the brand new Nhật Tân Bridge. One thing has not changed since BTN’s first visit and that is the seemingly chaotic traffic. Zebra crossings are only seen as an income for paint manufacturers and the one way street signs clearly cannot be read by peddle cyclists. Scooters are the norm, sometimes four up with kids on board too. Helmets are not compulsory. But if you are a government VIP your car gets a ‘blue’ number plate and the usual rules, such as they are, do not exist. The Vietnamese are also seemingly colour blind, traffic lights mainly for decoration. Brave visitors are happy to take a rickshaw ride, motorised or otherwise. The good news is that people do not drive fast and for the most part accidents are rare. Two days are not enough to sample one of the great cities of Indo China which celebrated its official 1,000 years of history in 2010. BTN was in the hands of VietCharm Tours, a well-established PATA operator, who will once again be at World Travel Market. Everything went smoothly, driver and guide excellent on what was in effect a normal tour package. BTN’s accommodation for a two-night stay was the Moung Thanh Hanoi Centre Hotel, 4-star, part of a large group, and very adequate. The rooms were perfectly acceptable and the staff friendly. A fairly standard buffet breakfast was offered and with a little sign language a fine cheese omelette provided. BTN chose a European style evening meal, the fillet steak perfect. Of course you can eat Vietnamese. There is also a bar on the roof serving snacks. The property is sited in the Old Quarter close by the lovely Haon Kiem Lake. In many ways it is similar to London’s Serpentine parkland with the roads much closer and a gathering place for both locals and tourists. In the centre is the Ngoc Son Temple once topped by a copy of the Statue of Liberty from 1887 to 1945 when the Democratic Republic of Vietnam was declared by Ho Chi Min. The French began to be ousted, the Roman goddess Libertas amongst the first to go. We were told she is not likely to return! Also close by is the Meliá Hanoi, definitely 5-star, with a Rolls-Royce showroom adjoining at street level. Communists, the workers’ party, certainly have a soft spot for smart foreign-built cars. Former USSR President Leonid Brezhnev is said to have had 50 of the world’s number one status symbol, the cars once built at Crewe. 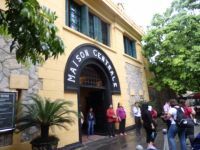 Sarcastically known to American prisoners of war as the "Hanoi Hilton", Hỏa Lò Prison is not for those with a weak disposition. Whilst most of it has been demolished the gatehouse area remains as a memorial from those grim times when the French colonists needed a ‘home’ for political prisoners. Manacled inmates laid in long rows on flat surfaces. A guillotine stands at the entrance to the death row block, grim dark cells the imminent end perhaps a relief to the inmates. As with most of the museums and important sites in Hanoi English language signs help engage visitors with decriptions. US Senator and former Presidential candidate John McCain was amongst many incarcerated in the "Hanoi Hilton". In October 1967, while on a bombing mission over Hanoi, he was shot down, seriously injured, and captured by the North Vietnamese. He was a prisoner of war until 1973. McCain, son and grandson of Admirals experienced episodes of torture, and refused an out-of-sequence early repatriation offer. 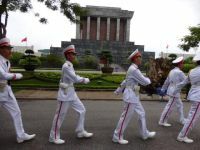 The Hanoi Military History Museum, whilst also covering earlier times, concentrates on the wars against the French and the United States. Extremely popular is the Water Puppet Theatre, also close by Haon Kiem Lake housed in a very modern theatre with full technological support, but also with a live band supporting the puppeteers, actually in the water but hidden by a screen.